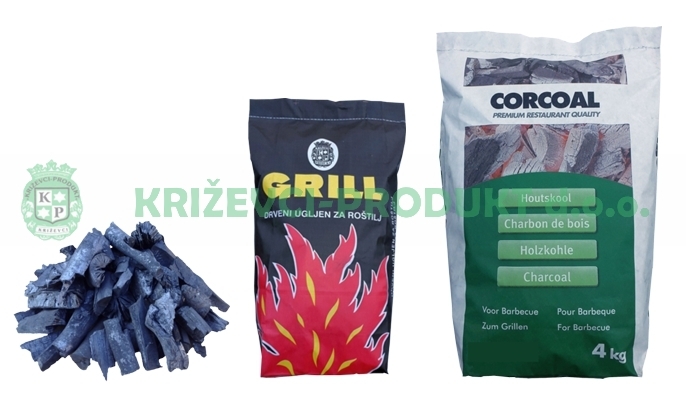 ﻿ Charcoal | KRIŽEVCI-PRODUKT d.o.o. Wood charcoal is a product that follow mankind throughout its history. Wood charcoal is obtained by heat treatment of wood. Wood charcoal has a wide range of applications ranging from medicine to industry, and has a special place in the home and hospitality industry to prepare delicacy. For this and other purposes, KRIŽEVCI-PRODUKT d.o.o. Produces this product since 1992. With the great experience in this production, we have achieved the quality of the top quality product that meets EU norms (GMP +, HACCP, FSC, EN 1860-2). It is used for preparing food for our families and friends. This product is developed for quick and easy use in a way that meets the expectations of every hobby user. A specially developed product for the professional users. This product is of high quality, smokeless, of larger fractions and is used for grilling on multi-hour (all day long) basis. Specially produced high-quality charcoal, which is smokeless, of larger fractions and is used for preparing food in Josper, Kopa and similar grill ovens.